Notes: These are my eyes for imaging. 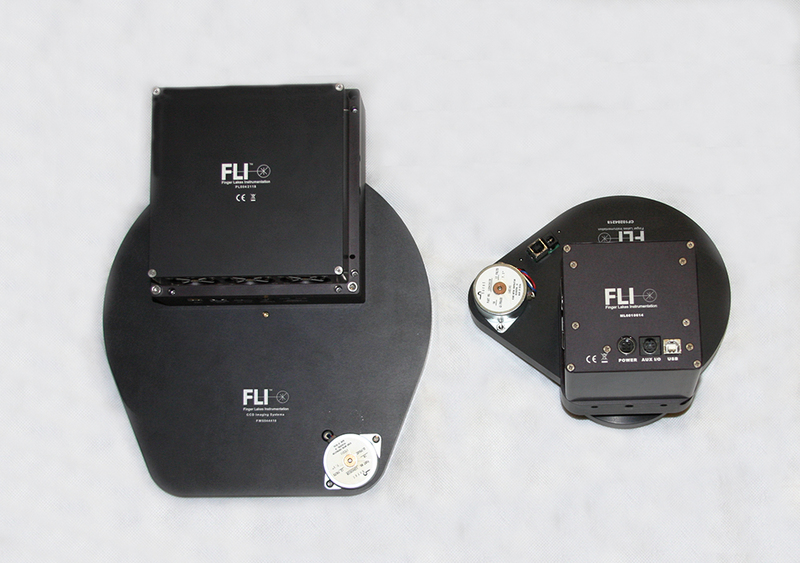 Finger Lakes Instrumentation, (FLI) they are the Microline line of CCD cameras they sell. On the left is the ML16200 and the FLI-CFW 2-7 filter-wheel that uses (7) 2” round filters with Astrodon 2” round Gen 2 LRGB and 3nm Ha, Sll and Olll narrowband filters installed. This camera uses the Semi- KAF-16200 C1 CCD chip with 6um square pixels and an array of 4500x3600 and a QE of 58%. The camera on the right is the MLx694 and uses the Sony ICX694AL chip and is an interline format with 4.54um square pixels and an array of 2750x2200 with a QE of 77% . More information on these cameras can be found on FLI’s website.